I made this card to give to my grandma as a thank you for a gift. It is an image from Our Daily Bread Designs. I love the lighthouse image and the scriptures that come with it. It is stamped in brilliance ink and colored with copics (my new favorite coloring tool!) The light house is stamped and colored a second time, cut out and adhered with foam dots. 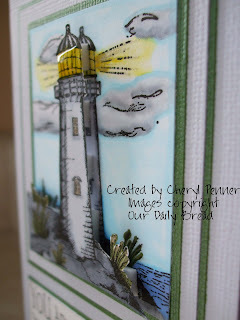 I used a Spica pen to add some sparkle to the light on the light house and the scripture. My last addition was diamond glaze on the top of the light house. I love the dimension on this one and almost didn't want to give it away! Beautiful card. Your detailing is excellent! This is gorgeous Cheryl!! I love the little bit of dimension. Cheryl, this card is just stunning! It's just perfect! Makes me want to escape to a beach somewhere! LOL! WOW the dimension of this card is AMAZING!!! This is so much beautiful & fantastic ! Seem so 3D. Love the dimension & your coloring is always fab! BTW ~ Visit our private blog, Janine is heading up an new atc swap, hope you can join! 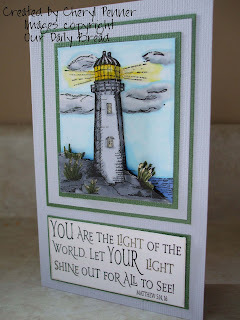 I love lighthouses and this card is amazing. I can see how you wanted to keep it. You made a lovely card. Beautiful card! I can see why you wouldn't have wanted to give it away it is just stunning! Your good! I am going to have to watch your blog now...I'm hooked.